USD is acting weak because of poor economic data and Switzerland is not publishing any influential reports. 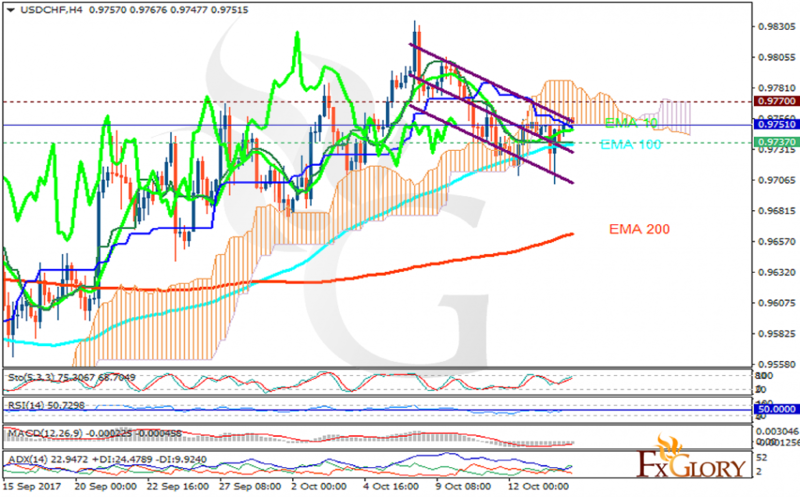 The support rests at 0.97370 with resistance at 0.97700 which the weekly pivot point at 0.97510 is located in between the lines. The EMA of 10 is moving with bullish bias in the descendant channel and it is located above the EMA of 200 and the EMA of 100. The RSI is moving on the 50 level, the MACD indicator is in negative territory and the Stochastic is showing upward momentum. The ADX is not showing buy signals. The price is in the Ichimoku Cloud and above the Chinkou Span. The Tenkan-sen is showing a horizontal trend while the Kijun-sen is showing a downward trend. The support level breakthrough will drag the price down to 0.9710 otherwise it will continue its bullish trend.